On this day in 2004 Arsenal lost in the Champions League and were knocked out. The headlines included statements to the effect that the season was in ruins. But as the headline above reminds us, Arsenal went on not only to win the league at White Hart Lane but also to win the league unbeaten – the only team ever to do so. It was a prime example of the media’s insane insistence on the notion that judgements can and should be made on the basis of just one match, rather than anything more substantial. As far as I know, none of the journalists or editorial staff at the papers who proclaimed Arsenal’s season to be over on this day were then replaced on the grounds of being too dopey even for football reporting’s modest standards. 6 April 1895: For the second time in one season Arsenal scored seven beating Crewe 7-0. The club then beat Walsall 6-1 just six days later. By the end of the season Arsenal had scored 75 goals in 30 league games. In only three games did they fail to score. 6 April 1896: Encouraged by the scoring of seven goals in the previous home match, a record crowd of 14,000 turned out to see Arsenal beat Newcastle 2-1. 6 April 1907: Sunderland 2 Arsenal 3 made it four wins in a row as Arsenal headed for their highest end of the season position thus far: seventh in the first division. 6 April 1910: First meeting of the group that wanted to buy out Woolwich Arsenal FC They made their bid on 9 April, and the liquidator and George Levey (who had a say in such matters as he was lead creditor) accepted the deal. 6 April 1914: The Islington Gazette reported (not completely accurately) that “Woolwich Arsenal” had become “The Arsenal”. The club publically changed its name on 23 April, but the board did not formally approve the change until 10 May 1915. 6 April 1917: Arsenal played Tottenham “away”. With Tottenham’s ground taken over by the War Office Tottenham normally played at Highbury. However clearly not wanting to give Arsenal too much of an advantage this game was played at Clapton Orient’s ground. 9,000 were present which was not bad given the continuance of the very bad weather. 6 April 1918: Arsenal played their final match of a disappointing wartime season losing 1-2 away to Fulham in front of 2000. Arsenal finished fifth in the league of 10, having won 16 and lost 15 games. 6 April 1920: Tom Whittaker’s debut. He joined Arsenal (his only club) after being demobbed in 1919, and played 64 league games over six seasons. It was Chapman who saw in him the ability to become a powerful trainer and coach – and ultimately league winning manager. He also achieved fame across Europe as a healer of injuries that others could not resolve. For the context of the match click here. 6 April 1927: Andy Young’s final game. He was a centre forward and half back who had joined from Aston Villa and played 68 games and scored nine goals. We have no details as to what happened to him after he left Arsenal. 6 April 1928: Arsenal 3 Cardiff 0. Arsenal won for the last time in the 1927/8 season. After this the club played 8 drawing 6 and losing 2. 6 April 1932: Sunderland 2 Arsenal 0. Last game for Ted Pat Beasley after 79 league games and 19 league goals, before moving on to Huddersfield. 6 April 1965: Tommy Baldwin’s first Arsenal game. He played just 17 league games for Arsenal before being transferred to Chelsea in 1966. 6 April 1971: Arsenal 1 Coventry 0. Ray Kennedy’s 25th of the season. Leeds drew with Newcastle meaning Arsenal were just four points behind with two games in hand – the first time Arsenal were in this position since mid-January. Arsenal’s goal difference was 0.03 goals better than Leeds’. 6 April 1993: Middlesbrough 1 Arsenal 0 symbolised the plight of Arsenal. Middlesbrough were relegated but Arsenal could not manage a goal as they headed to just 40 league goals all season in 42 games – fewer than any other club in the division. 6 April 1995: Arsenal 3 Sampdoria 2 Cup Winners Cup semi final 1st leg. 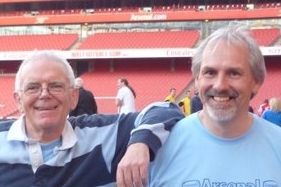 Two from Bould (rather extraordinarily) and one from Wright gave Arsenal a narrow win. 6 April 2000: Arsenal 1 Lens 0; Uefa cup semi final. Arsenal won this first leg through a goal from Bergkamp in the 2nd minute and the opinion from the media was that this was nowhere near enough. (See 20 April). 6 April 2002: Arsenal 2 Tottenham 1. League match 33 of the 3rd Double season, the 8th game of 13 consecutive wins to the end of the season. Ljungberg and Lauren scored. 6 April 2004: Arsenal 1 Chelsea 2: Champions League Quarter Final second leg. Reyes gave Arsenal the lead, but Lehmann gifted the equaliser and Bridge scored with three minutes to go. The press headlines were “It’s all Gun wrong” and “Arsenal season in ruins”. The ruins included winning the Premier League unbeaten just 39 days later.